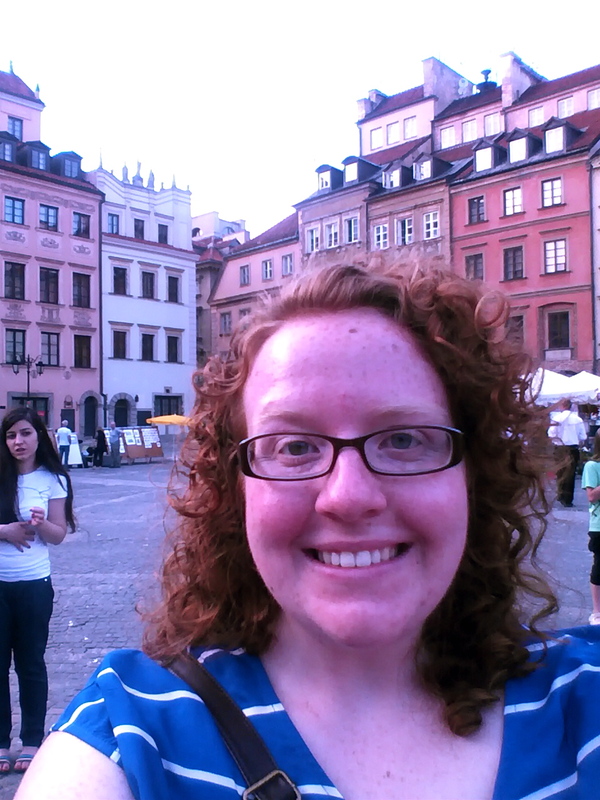 It’s been a week since my fellowship with HIA Poland began and I have already learned SO MUCH. I came knowing almost nothing about Poland or Warsaw, its capital. I still can’t claim to know very much, but I know a lot more than I did and this knowledge is adding some depth and context to the city and people I’ve slowly started to get to know. On a practical note, I’ve learned how to stand on a tram, facing the windows so you can transfer weight from one leg to the other. If you try and face the front you end up falling forwards and backwards and looking like an idiot even more than you probably already did. Trust me on this one. And I’ve learned how to read bus and tram schedules. I have successfully found my way home from a couple parts of the city all by myself! It’s almost like I’m an adult here! Woo! And I’ve learned that only Americans wear shorts and flip flops. Either item is a dead give away that you’re American. And I wear these things anyway, mostly because my Polish roommate told me I don’t look Polish so there’s no point in pretending. All of these little facts are helping me survive and not feel so out of place here in Warszawa (say it as if the “w”s were English “v”s – “Varshava”). Apart from these smaller points of existence, I have also learned quite a bit about the history of Warsaw and its citizens, especially the 20th century. 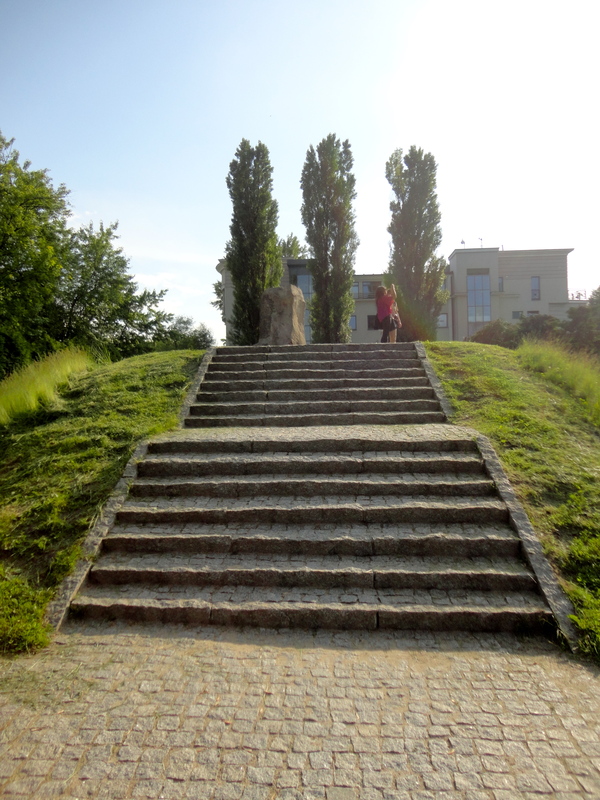 A large part of the HIA Poland program is geared towards learning about WWII and the Holocaust. We study this in the US, but it’s a very disconnected form of study. The weight of this history is felt here in a way that it is not in the States. I feel it’s probably impossible to get to know contemporary Poland and Warsaw unless you learn about this chapter in their history. I’ll try and tell you just some of the basics so you can make sense of anything else I might write in my time here. The Polish Kingdom existed for centuries and was considered a multicultural society, with Poles, Ukrainians, Jews, and Lithuanians, among others. The kingdom and the people had a strong national identity, with distinct cultural systems and a unifying language. Then, in the 18th century, the kingdom was effectively split up between its larger European neighbors. The kingdom just ceased to exist. Yet, Poles still retained their identity as Poles, holding onto their traditions and language. Poland was divided until the end of the First World War, when it was again declared an independent nation. Interwar, independent Poland was still considered diverse, with a mix of Eastern European peoples, including a Jewish population of around 3.5 million. The country was a center for European-Jewish culture. Warsaw was the national center of this community, with 1/3 of the city’s inhabitants being Jewish. WWII began when Nazi Germany invaded Poland. Though the Polish army resisted, Nazi forces quickly moved to occupy the western part of the country. Russia took over the east. Warsaw fell under Nazi occupation early and the Warsaw Ghetto was established soon after. At its fullest, the Warsaw Ghetto held over 400,000 Polish Jews, making it the largest Jewish ghetto in Nazi-occupied Europe during WWII. A large part of the city was walled off and its inhabitants were slowly starved. After 2 years, in 1942, the Nazis sped up the extermination process. Every day, thousands of the Jewish ghetto inhabitants were sent to Treblinka Extermination Camp a few hours north of the city, where 5,000-6,000 Jewish citizens could be killed in a day. By the end of 1942, most of the ghetto’s inhabitant had been killed, with about 35,000 left as workers in the ghetto and another estimated 30,000 left in hiding. In the Spring of 1943, around 1,000 of these inhabitants decided to revolt against their oppressors. Ill-equipped and severely outnumbered, the Warsaw Ghetto Uprising was not really an attempt at freedom. It was more of an assertion of dignity, ensuring that the up-risers got to choose their own death, instead of dying in gas chambers. Even though they had few weapons, the Warsaw Ghetto Uprising managed to fight for a little over a month. In the end, the Nazis burned the whole ghetto, murdering all of the remaining inhabitants. After the Ghetto was liquidated, the Nazis continued to occupy the Polish parts of Warsaw. Poles are a Slavic people and according to the Nazi racial structure, Slavs were just above Jews. Throughout the war, Poles had been murdered indiscriminately as signs of force and hundreds of thousands were deported to work camps in the east. The Polish intelligentsia was murdered as soon as they were occupied and any town or village that tried to resist was brutally punished. The Polish population of Warsaw was in contact with the Polish government in exile throughout the whole war. A year after the Warsaw Ghetto Uprising, in 1944, they learned that Russia and Germany had formed a secret agreement to split Poland after the war. Determined to remain independent, the Polish leadership in Warsaw planned the Warsaw Uprising. The inhabitants of Warsaw staged a violent revolt in an attempt to retain sovereignty. Though they fought for 2 months, the uprising was squashed and Warsaw was destroyed. Russia was supposed to help Warsaw as a means of weakening Nazi control over the region, but they stopped on the other side of the river and literally watched Warsaw burn. As the Nazi took military control over the city, they murdered close to 200,000 civilians, lining them up on the street and killing them. Once they had control, they burned the city behind them, leaving almost nothing. This is the wall of what was an old hospital. 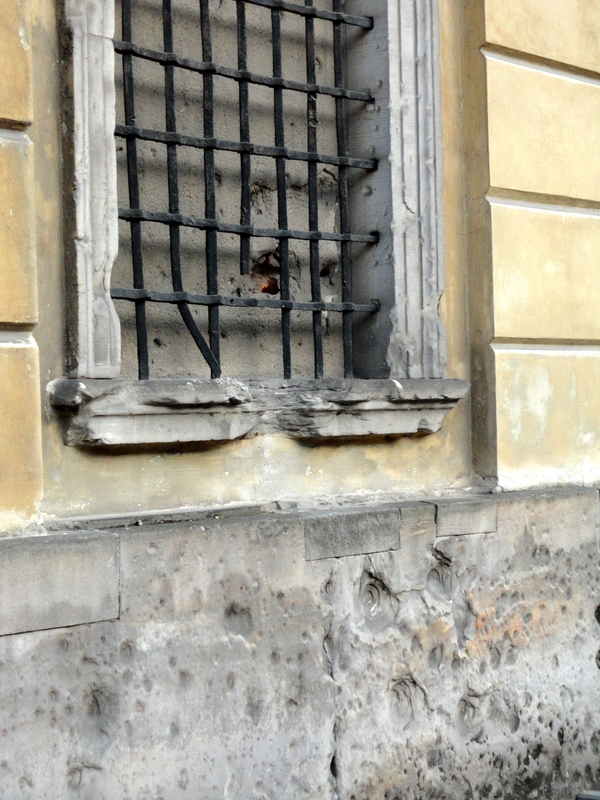 It is one of the few buildings that survived the Uprising and you can still see the bullet holes where SS soldiers murdered the patients and hospital staff. After the war, the Soviet Union took control of Poland and it remained under Soviet control until 1989. Demographically, with the Holocaust and boundary changes, the country became almost entirely homogenous, with around 95% of the population being ethnically Polish. During the Soviet time, much of the wrongs done to Poles in the east by Russians were twisted and attributed to the Nazi soldiers. It has only been the last 20 years or so in which the truth about atrocities done by both the Nazis and the Soviets has begun to be sorted out. Also, because 80-90% of Warsaw was destroyed, almost all of the “old looking” buildings are buildings that have been rebuilt from photographs or paintings. For example, Old Town, the original walled city was completely destroyed and then rebuilt according to artists’ depictions of it. 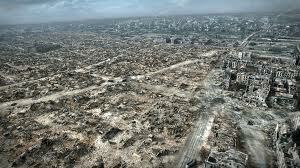 A restored photo of Warsaw after WWII. The rebuilt and restored historic square of Old Warsaw. So, this was a lot of history and kind of a long story, but I’m finding that the more I understand this story, the more able I am to understand what my Polish friends are talking about. Poland has been occupied and split up and traded for centuries. Its citizens have been enslaved and murdered and subjugated for generations. When my Polish friends talk about freedom or oppression, it is not a far off, distant ideal. It’s a very real and present experience. Many of my friends were children when Poland gained independence from the Soviet Union. They say their Polish identity has been shaped by this history and the approaches they have towards issues of diversity or discrimination are a direct result of this heritage. It’s a long story, but it is one that I am so grateful to get to learn because it is allowing me to develop relationships in a context that is more meaningful and understanding than it ever could have been otherwise. Lots of love from Warszawa!